Napoleon’s adage, an army marches on its stomach, took on new meaning in the 20th century. In addition to rations, having a few dollars in soldiers’ pockets was essential to the well being and efficiency of the army. Managing the pay and allowances for army personnel was the responsibility of the Royal Canadian Army Pay Corps (R.C.A.P.C.). The Corps was authorized in 1907, and granted the Royal designation for service in the First World War. Responsibilities included the administration of pay for personnel both overseas and in Canada during the Second World War. In the post-war army the RCAPC continued with these duties, for both the reserves and the regular army, in Canada and on deployments. The R.C.A.P.C. was unique among army corps. Purely administrative in nature, it provided the Chief Paymaster, Command Pay Offices, Paymasters Canadian Troops, field cash offices, and unit paymasters overseas, and pay services for base units, formations and units in Canada. Similar duties continued after the war, with the R.C.A.P.C. providing pay services for the regular army and reserves. With a small establishment spread throughout the army, the need for Corps insignia was essential. Unique titles and formation signs were authorized to identify R.C.A.P.C. personnel and foster Corps esprit. ii. or superimposed on the Divisional or Corps Patches – Authorized abbreviations only. Finally, Paragraph 7, RO 450 required that “The methods and or designs adopted in respect of paragraphs 1 (a), 2 (a), 3, 5, and 6 above will be uniform in each Corps and Service throughout the several divisions and Canadian Corps Troops”. These were all subject to the approval of the Senior Combatant Officer. With these directions, the Canadian Army (Overseas) initiated the procurement of embroidered cloth insignia for unit and formation identification. The overseas contingents of the R.C.A.P.C. adopted a coloured shoulder title made in an upwards arc, embroidered with the Corps abbreviation “R.C.A.P.C.” in primrose yellow on blue. The lettering was stipulated to be ½ inch high. Official authorization for these titles has not been located, but the firm of Hobson and Sons indicate they had filled orders for R.C.A.P.C. titles in 1941. Samples were requested by Canadian Military Headquarters (CMHQ) for reference and sealing in 1942. 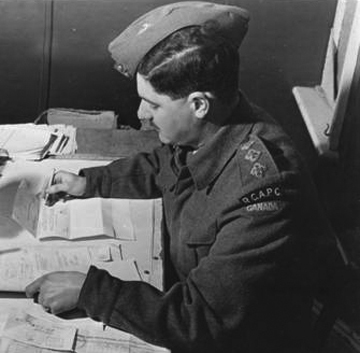 When the Canadian Army (Overseas) switched to printed titles in 1943, a printed R.C.A.P.C. title copied from the embroidered pattern was contracted. These were to be worn in combination with plain formation patches. Capt. J.R. Wait, Adj. P.M.C.T. Det. R.C.A.P.C. United Kingdom, January 1942. Canadian Military Photo. 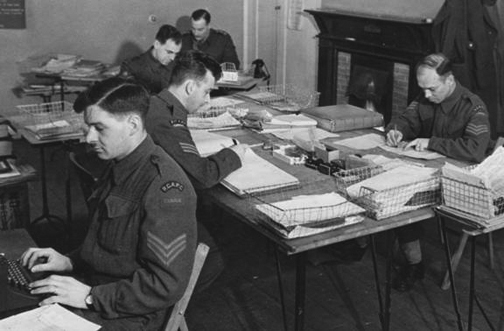 Accounts Department CMHQ January 1942. Canadian Military Photo. In Canada, a different policy for cloth insignia had been pursued. The first authorized unit insignia was the slip-on. These were a trapezoid shape, wider at the base, made of drab khaki worsted material, with the approved corps or regimental abbreviation embroidered in black thread. The slip-on had two cotton tapes on the reverse for sliding over the shoulder strap. The R.C.A.P.C., like the rest of the army in Canada, was issued with the slip-on in 1940. Summer slip-ons, the same shape and size as the worsted slip-ons, but made of khaki drill material may have been made. These were the only authorized distinctive corps cloth insignia for wear in Canada, in contrast to the coloured insignia being taken into wear overseas. The steady stream of personnel moving back and forth between the United Kingdom and Canada contributed to a demand for coloured titles at home. Addressing the problems created by two different policies, one for overseas and one at home, National Defence Headquarters (NDHQ) finally conceded and on January 5, 1942 approved the issue of coloured titles for the active army in Canada. With Pay Corps personnel returning to Canada with coloured titles, there had already been requests sent to NDHQ to wear the Corps coloured titles. By early March, abbreviated titles for the R.C.A.P.C. were authorized. The titles were the same colours as overseas, but the Canadian pattern was to have lettering 3/8th inch high. These were produced in Canada for R.C.A.P.C. personnel serving at home. 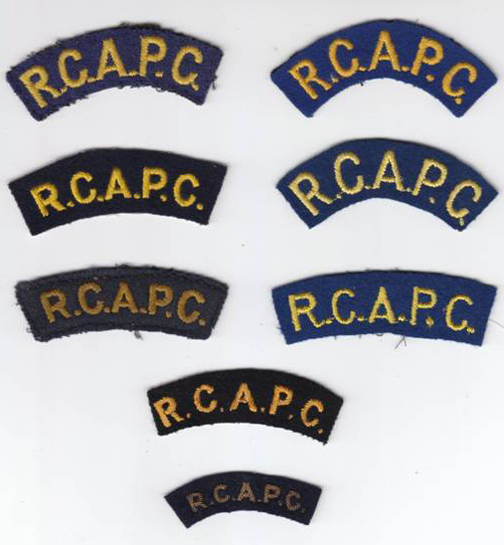 Several varieties of R.C.A.P.C. abbreviated titles. Primrose yellow was open to interpretation, as can be seen in the different colours of embroidery. The bottom title is made in bullion wire. Authors collection. Printed R.C.A.P.C. title. Note the colour of the lettering. Author’s collection. Under RO 450, imposed formation patches had been approved as an alternative form of identification for overseas units, but the order had stipulated that there must be consistency within the corps. Confusion surrounded this policy. Initially, with only one Canadian Corps (the army formation) in existence, the intention was that Corps units serving in the Canadian Corps would be identified by the diamond shaped patches, but these patches would be in the respective Corps colours, (as in cherry red for Royal Canadian Army Medical Corps, or green for the Canadian Dental Corps, etc). 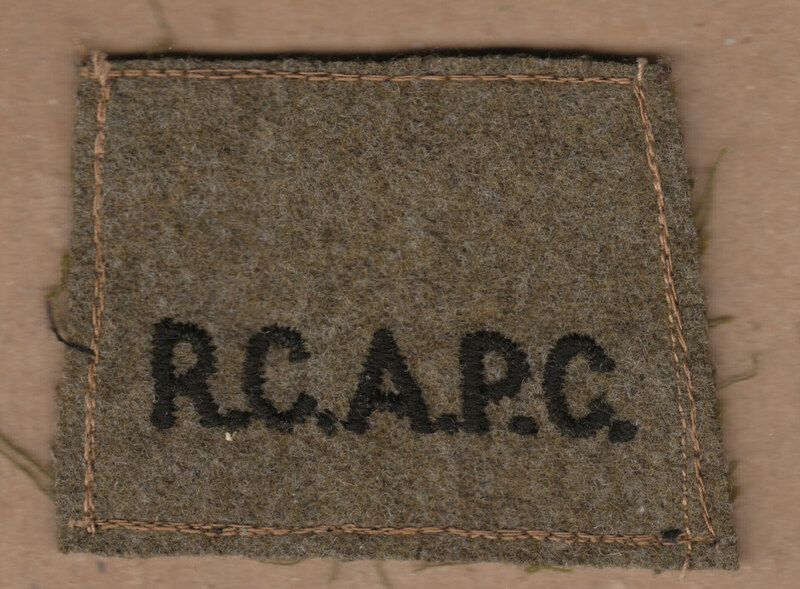 Despite already having a shoulder title, the R.C.A.P.C. also adopted a diamond shaped patch for wear by their units in the Canadian Corps. 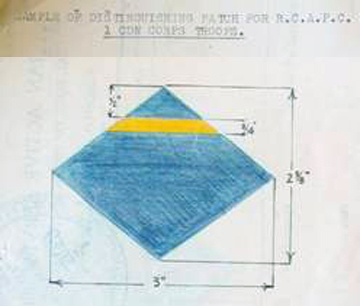 The requirement that the Canadian Corps patch be in the proper corps (branch) colours resulted in a diamond shaped patch in blue with a small yellow bar 1/2″ below the top point. With the adoption of red diamonds as the formation sign for 1 Canadian Corps, the R.C.A.P.C. patch became obsolete. Sketch of the authorized formation sign for the R.C.A.P.C. 1 Canadian Corps troops. LAC RG 24 Vol. 10053. File 13/DIST/1/6. With mobilization in Canada of the 3rd Canadian Infantry Division, 4th Canadian Armoured Division and 5th Canadian Armoured Division, the question of insignia for these formations was addressed. As they were destined to serve overseas, they were subject to the policy set out in RO 450. But, it was decided that these formations should acquire most of their insignia in Canada before proceeding overseas. Poor communication, differing interpretations of policy and the distance between Canada and the UK complicated these procurements. No records for an R.C.A.P.C. 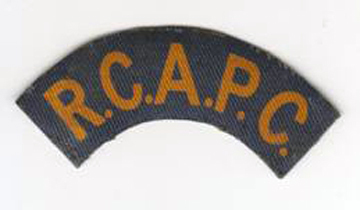 3 CID patch have been documented in Canada, but imposed formation signs for the R.C.A.P.C. on 4 CAD and 5 CAD division signs were manufactured in Canada. These signs were not in keeping with the overseas practices where the R.C.A.P.C. wore the shoulder title with plain formation patches. It is not likely signs for R.C.A.P.C. 4 CAD and 5 CAD were actually taken into wear. R.C.A.P.C. embroidered patches for 4 Canadian Armoured Division and 5 Canadian Armoured Division. Author’s collection. Imposed formation patches, if taken into wear, were being phased out by the Canadian army overseas by 1943. Both overseas and in Canada, Pay Corps personnel were identified by the abbreviated coloured titles and where appropriate, plain formation patches. Their shoulder title, either embroidered or printed, remained the only authorized pattern into the post war period. R.C.A.P.C. bullion shoulder titles in gold wire on dark blue and a bullion wire R.C.A.C.P. 3 CID formation patch, in gold wire on French gray have been documented. These were not authorized, and were likely private purchase. (a) The material will be of cloth background with embroidered lettering. (b) No device other than the corps designation, or unit designation in the case of the RCAC and RCIC, will be used on the badge. (c) The outside dimensions will not exceed 6 inches in width or 2 inches in height, and will be of such size as will permit recognition at a reasonable distance. (d) The number of colours used will be limited to three, including the embroidery (two are preferable and customary). (e) For corps, the name of the corps will be lettered in full. For units, the name of the unit will be lettered in full where possible. (f) When the word “Canada” or “Canadian” in full does not appear in the title the word “Canada” will be added within the bounds of the badge. (g) The size of the lettering used in the badges will depend upon the length of the unit designation. Script will NOT be used. These rules immediately impacted the shoulder titles worn by many Corps of the Canadian Army, including the R.C.A.P.C. The requirement that corps titles be fully spelled out and include clear national identification meant the R.C.A.P.C. abbreviated title was no longer acceptable. A re-design of the shoulder title was required, and on November 5, a new design was submitted to the Director of Ordnance Services. 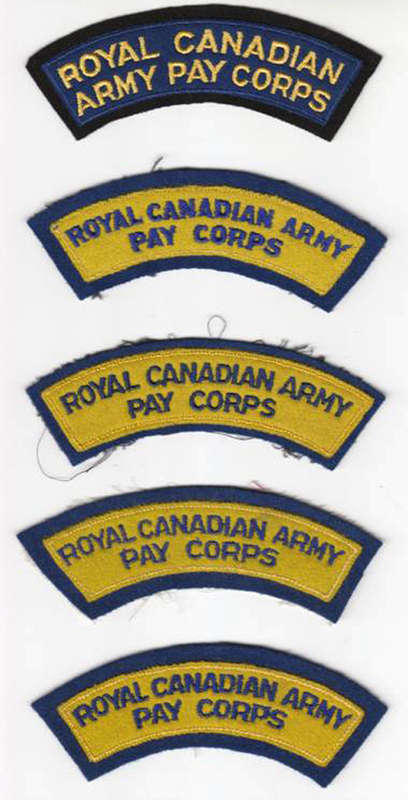 It was requested that the “lettering of the badge be in yellow, individual letters being 3/8” high, on a blue background 1” wide, which in turn will be superimposed on a black backing, which will have an overall size of 5” in length and 1 ¼” in width.” The design, reading “ROYAL CANADIAN / ARMY PAY CORPS” was approved in February 1948, with a minor modification, changing the lettering to 5/16” high. In May, samples were reviewed at a conference of Command Paymasters, and “the badge was found very suitable with no adverse comment”. Procurement was completed and the new titles were taken into wear. 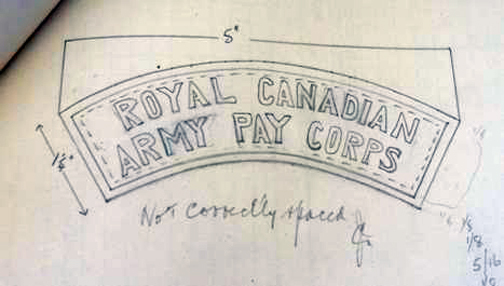 Sketch of proposed Royal Canadian Army Pay Corps title, 1947. RG 112 Vol.29710 Box 261 File 5250-0001/11. The new R.C.A.P.C. titles did not sit well in some quarters. 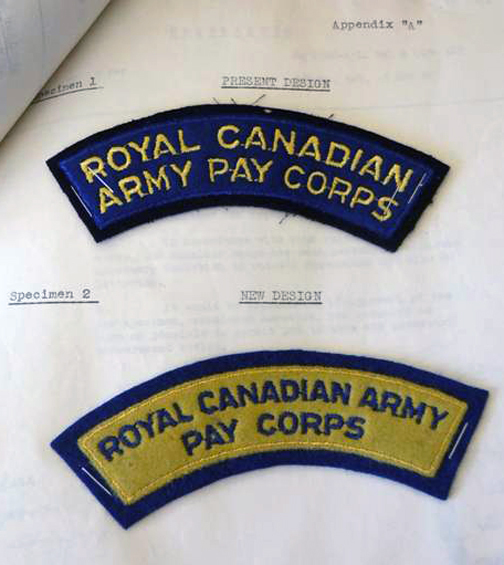 The Commanding Officer of the Royal Canadian Regiment took exception to the titles, complaining to the Vice Adjutant General that “the new RCAPC cloth shoulder badges are unnecessarily similar to those previously approved and adopted by the RCR.” The complaint was referred to the Director of Pay Services, who pointed out several differences in detail, and indicated no changes should be made to their title. The argument failed to sway the Vice Adjutant General, as these details were not significant differences. In May, a new design for the R.C.A.P.C. title was submitted. The design reversed the colours of the lettering with the field colour; the embroidery was blue on yellow, and the backing was changed to the same blue as used for the embroidery. The distribution of wording was also changed, with the revised title reading “ROYAL CANADIAN ARMY / PAY CORPS”. The revised design overcame “the objection of similarity with those of other corps or units, notably the RCR.” Despite the reluctance of the Director of Pay Services, the revised design was authorized and procurement initiated. In the space of four years the R.C.A.P.C. had gone through three designs of titles. RCAPC full titles. Top, 1947 pattern title. Bottom, 1950 pattern title. RG 112 Vol.29710 Box 261 File 5250-0001/11. Post war through unification R.C.A.P.C. titles. 1948 pattern at top, 1950 pattern titles below. Author’s collection. Having battled Army Headquarters and lost, the Pay Corps quietly adopted the new revised titles. For the next 13 years they carried on their duties, wearing this title. Then in 1962, correspondence crossed the desk of the Director of Pay asking the Corps to consider another change in their titles. During the 1947 revisions, the Royal Canadian Army Service Corps, the Royal Canadian Army Medical Corps, the Royal Canadian Army Chaplain Corps and in 1950, the Royal Canadian Army Pay Corps all had titles which the top line of the designation read “ROYAL CANADIAN ARMY” with the remainder of the specific corps designation in the second line. It was pointed out that this was misleading, as there was no such organization as the “ROYAL CANADIAN ARMY” and it would be more appropriate if “ROYAL CANADIAN” was used as adjectives, describing the “ARMY SERVICE CORPS”. Likewise, the same line break should be applied to the titles of the other three corps. The request met with a luke-warm response from the Director of Pay. He noted that his corps was commonly called the “PAY CORPS”, consistent with the line break on the existing titles. Should the other corps agree to the revision, he would be willing to change “in the interests of uniformity”. The opinion of the Director of Pay held little sway, and new titles reading “ROYAL CANADIAN / ARMY PAY CORPS”, in the same colours as the existing title was approved October 24, 1963. Following established practice, it was indicated that the “new badges will be obtained as normal maintenance replacement is required. The new badges will be issued when stocks of the current pattern badge have been exhausted.” In a penned note on the same memorandum, DOS indicated a need for 1,000 R.C.A.P.C. titles per year. There was an inventory of 14,000 titles in stores. A succinct observation by the Director of Pay Services indicated it would be some time before new badges appear. With other changes in play, the new titles were never needed. With unification the R.C.A.P.C. was initially incorporated in the Logisitics Branch and later moved to the Administration Branch of the Canadian Forces. At present the pay duties are under Logistics again. An essential service, the personnel of the Pay Corps had quietly and efficiently fulfilled their duties. The shoulder titles worn in peace and war, in Canada, overseas in the Second World War, in Korea, and on numerous UN deployments were obsolete. The 1963 pattern shoulder title approval. These were never produced, as existing inventories of 1950 pattern were still available until the R.C.A.P.C. was absorbed into the Administrative Branch Canadian Forces at unification. RG 112 Vol.29710 Box 261 File 5250-0001/11. Library and Archives Canada RG 24 various volumes, and RG 112 Vol. 29710 File 5250-0001/11. Army Historical Section, The Regiments and Corps of The Canadian Army, Ministry of National Defence, 1964. Pg 29. Canadian Army Routine Order (Overseas) 450, November 1940. Several makers supplied embroidered insignia to the Canadian Army (Overseas) which results in titles that with minor variations in colours, embroidery styles and size. LAC RG 24 Vol. 10053. Hobson and Sons (London) LTD., Letter to Maj. Miller, D.A.D.O.S. Canadian Military Headquarters, May 16, 1942. The printed titles were manufactured by Calico Printers Assoc. The lettering on the printed title is an amber or gold yellow. Domina, H.L. for Inspector General, Inspection Board of United Kingdom and Canada, Letter to The Secretary Dept. Of Munitions and Supply, January 7, 1941. LAC RG 24 Vol 2186 Box 1 File HQ 54-27-60-3, and McColm, R. Lt. For D.O.S. (G.S.) Letter to Mr. Torrence Department of Munitions and Supply. February 24, 1941. LAC RG 24 Vol 2186 Box 1 File HQ 54-27-60-3. DEFENSOR Cable to CANMILITARY, Cable description coloured Unit Titles now authorized in Canada for personnel of Corps and Services not belonging to formations. LAC RG 24 Vol. 2185 File 13/DIST/1/5 Folio 162. Initially there was a size difference in the lettering for the R.C.A.P.C. and R.C.O.C. titles at 1/2” lettering as compared to the 3/8” lettering on later titles. It was argued that for consistency and efficiency the titles should all be embroidered with the same size lettering. The R.C.A.P.C. titles authorized in Canada were based on examples sent to Canada from overseas. 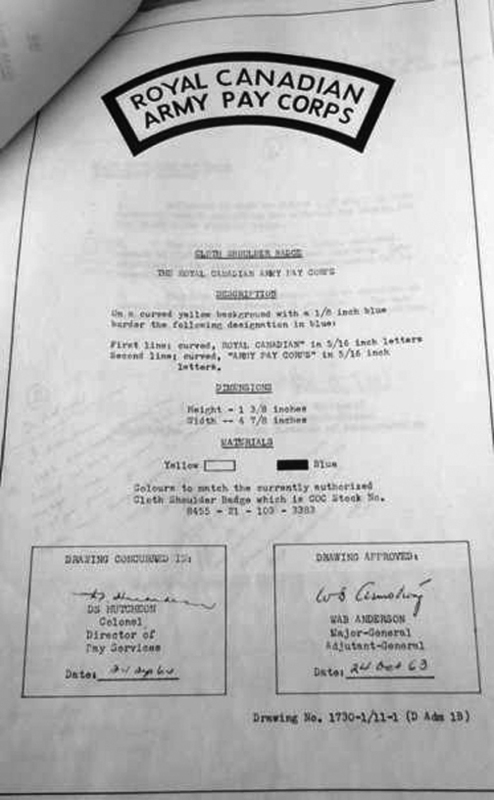 Contracted titles appear to have ignored the size specifications in most cases. The Canadian produced samples were in turn sent back to CMHQ as samples. MacQueen J.H. Brigadier D.Q.M.G. CMHQ, Memorandum, April 17, 1942. RG 24 Vol. 2186, File 13/DIST/1/5, Folio 186. The Canadian Corps was re-designated 1 Canadian Corps April 6, 1942. The First Canadian Army was authorized the same day, with an order of battle consisting of two Corps. A new formation, 2 Canadian Corps was authorized, but not immediately organized. The question of Corps identification resulted in a simplification of the formation patch system. Red diamonds, echoing the red divisional patch of 1st Canadian Infantry Division was chosen as the standardized formation sign for the 1st Canadian Corps, and blue echoing, 2nd Canadian Infantry Division was selected as the colour for 2nd Canadian Corps diamond shaped formation sign. Various letters and memos, 1947-1948. LAC RG 112, Vol.29710, File 5250-0001/11 Vol. 1 Dress Instructions Royal Canadian Army Pay Corps. At one point in the correspondence, DOS suggested that perhaps the OC RCR consider submitting a new design for his regiment. Various letters and memos,1962-1963. LAC RG 112, Vol.29710, File 5250-0001/11 Vol. 1 Dress Instructions Royal Canadian Army Pay Corps. Excellent research, Bill. With the photographic examples of each shoulder title, it is easy to follow the evolution. I didn’t realize how much I didn’t know about this!